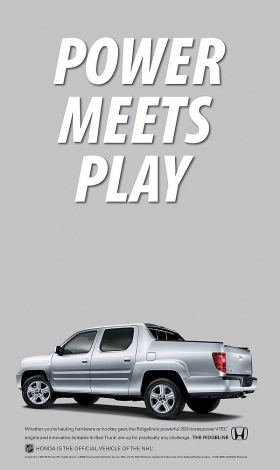 Hondas sponsorship of the National Hockey League includes print ads for the Ridgeline pickup. While other automakers pare back their sports sponsorships, American Honda Motor Co., Honda Canada and the National Hockey League have launched a three-year deal that makes Honda the league's official vehicle. Under the sponsorship that began Jan. 1, Honda is advertising during broadcasts of NHL games and on the league's Web site, nhl.com. The brand also is displaying vehicles and signs in NHL arenas and taking part in league promotions. Terms of the deal were not disclosed. Honda replaced Dodge, which had been the league's automotive sponsor for five years. Honda executives say the sponsorship is an ideal way to reach potential buyers. "The demographics of people who watch hockey games — the index is very high for purchase of Honda products," said Tom Peyton, Honda's senior manager of national advertising. Peyton told Automotive News that there is a significant correlation of owners of the Honda Pilot crossover and NHL season ticketholders. Honda's NHL advertising primarily features the Pilot, Ridgeline pickup and Odyssey van. Honda spokesman Chris Martin says the NHL's "innovative" Web site will enable the brand to advertise worldwide. Keith Wachtel, the NHL's senior vice president of corporate sales and marketing, says Honda is a global brand, just as hockey is a global sport. Says Wachtel: "The lines between domestic and import brands have blurred."